Several Northeast Creek wetlands consist of alluvial flood plains that include swamp forests, braided streams, stream meanders, and ox-bow ponds. Conserving the natural and cultural resources of Northeast Creek requires attention to the water flow, the water quality, the overall ecology of the suburban region, the open spaces, the provisions for wildlife, and the place of historic sites, buildings, and structures within the functioning of the communities in the watershed. There are actions that you can take on your own, with your family, with your neighbors and as part of participation in Northeast Creek Streamwatch. Harvesting rainfall on your property means paying attention to the uses that can be made of the water that is currently channeled to get it off the property as quickly as possible lest it cause drainage problems. You can store the runoff for later use as a landscaping water source. There are a variety of ways to do this, but an increasingly popular way is to collect your roof runoff in rain barrels or cisterns to which you can connect your garden hose of irrigation system. You can retain runoff for a short time in order to allow it to percolate into the ground water system. Popular ways of doing this are with rain gardens or retaining ponds. These are often placed to store runoff from sidewalks or driveways. Or you can size them to store amounts equivalent to the first inch of runoff on your roof, sidewalks, patio, and driveway. A low-cost way of harvesting rainwater is to have your downspouts flow into garden areas or large areas of absorbent organic matter that will hold the water for about three days. Holding water in one place for longer than three days increases the probably of mosquitoes breeding. Most counties now require residential subdivisions, multifamily housing, commercial development, office development, and industrial development to install these measures during development to offset the common impervious surfaces of the development. Another possible action is persuading the owners of older developments to retrofit those measures to harvest runoff. Not only does harvesting runoff provide for a wiser use of water — using harvested water for landscaping instead of buying City water — it prevents neighbors downstream of your property from having stream enlargement problems as a result of erosion from rapid runoff after rainstorms. Harvesting rainwater and using it for landscaping or for the plants growing in rain gardens and retention ponds cleanses the water in two ways: (1) percolation through soils, especially with topsoil that contains healthy mixtures of soil forming organisms, cleanses impurities out of the water; (2) the plants watered by the harvested runoff let pure water vapor into the air through the process of evaportranspiration. Wetlands function like large rain gardens and retention ponds in cleansing the runoff but on a proportionately larger scale, depending on the acreage that drains into them. The wetlands in the Northeast Creek basin tend to have the following pattern: the main channel flows into a flood plain that fills almost every time it rains; downstream of that flat plain is a section of braided streams that continually change course over time and also flood with almost every rain; down stream of the braided streams are one or two main channels with increasingly sharp meanders that overflow their banks only in major rainstorms; between the meanders in these sections are often ox-box ponds that represent meanders that have been cut off by sedimentation from previous flooding. This system causes the water to drop a lot of the sediment it carries from the headwaters and layer alluvial soils in the wetlands. 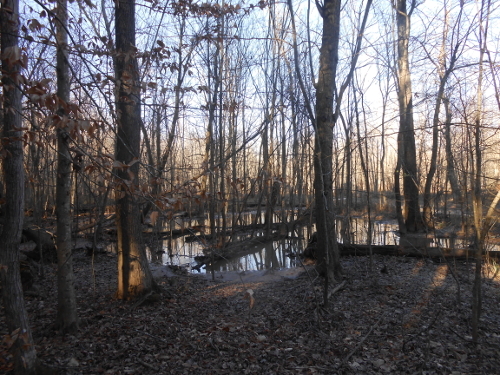 Areas that are so low they are always flooded and forested with water-loving trees become swamp forests. Areas in which trees cannot get established become freshwater marshes, with growths of cattails and other marsh plants. Areas that are frequently flooded lose their ground cover and understory growth and have a “parked out” appearance, with growths of grasses and wildflowers in dry periods. Beavers build dams along streams that create wetlands and alter the way existing wetlands operate. Human beings build structures, like sanitary and storm sewer systems that also alter how the wetlands operate, effectively creating dams that establish swamp forests permanently. They also build waterfowl impoundments to slow the volume and speed of runoff and establish small lakes for migrating or local waterfowl. In addition to cleansing the water and slowing peak flooding, wetlands provide suburban residents the thrill of seeing wetland wildlife species. The margins of wetlands provide habitat for woodland wildlife species. Environmentalists have become concerned about the growth in the popularity of exotic non-native species of plants and more concerned about those species now naturalized in the environment as invasive non-native species. The most famous example of an invasive non-native species is kudzu, the large-leafed vine imported to stop gullying that took over the landscape of the South. The first thing to do to preserve and propagate native plants is to rid your own life of invasive plants you do not intend to manage or contain on your own property. The second is to clean out invasive plants that have spread into nearby woodlands or wetlands. Begin transitioning the properties near your own into native plant preserves through conversations with your neighbors about native plant alternatives to popular nursery plants. Not all non-native plants are invasive, but some popular ones, like English ivy, nandina, ligustrum, and ailanthus (Tree of Heaven) are and must be constantly eradicated from spaces that do not receive regular landscaping maintenance. Substituting native plants that are acceptable alternatives and eradicating wild stands of these is the best solution. Other non-native plants are introduced weeds. Next consider collecting and planting native plants yourself. Rule #1: Do not collect and plant native plants by digging them up. Grow them from collected seed. It forces you to learn enough about the plants to be successful at matching the habitat and surrounding. You observe where the plant is successful and determine if there is any place on your property that is similar. If not, don’t waste a plant’s life trying. If you are really eager about native plants, the North Carolina Native Plant Society has resources and events to help you successfully raise native plants. The North Carolina Botanical Garden in Chapel Hill NC is another resource for information and for plants for your garden. Remember that most of the wildlife that you live among were here first and we are the invasive species with our roads and houses and utility wires and lamp posts, and birdhouses and bird feeders (from a squirrel’s view a “restaurant tree”) and nice nesting pots and big snug attics and soffits, well-stocked kitchens, and plentiful water. Start by learning about the wildlife that inhabits your house with you. Learn which species are native and which have been brought with settlement and residential development. Decide which are useful enough to have earned the status of inside wildlife (in their usually out-of-the-way places), which must be evicted to the outside, and which can be kept outside through proper home maintenance. Then look at the species in your yard, starting with the species that help make your topsoil. In this regard, make note that the earthworm is not a native species but an invasive. The earthworm’s conquest of the North American continent and the usefulness of the earthworm to agriculture is such that it is considered an important worker in your home landscape. Learn about the other working species who break down your food scraps, leaves, and refuse into compost. Then look at the inhabitants of your flowers, shrubs, and trees. Without your bird feeders, the birds still feed on plants and animals in the environment. Learn how what you plant can provide not just food but the food web that attracts more than just seed-eaters to your yard. Find out which larvae pests become which attractive butterflies and moths. Look at how your yard fits into its larger environment. Do you have deer in your neighborhood? Where do they browse? What do they browse on? Where do they sleep? As more open space is developed, wildlife is squeezed into smaller territories. Are these territories large enough for the wildlife to survive? Are they connected through several neighborhoods so that there is a large enough habitat? Are their feeding paths interrupted by roads without alternative means of crossing, leading to wildlife deaths and dented automobiles? Plans from 30 years ago envisioned the woods around stream systems as a de facto greenway for wildlife migration across suburban areas and urban areas to connect wildlife habitats with each other. The way that land is developed and landscaped affects how well that happens. The same issues with habitat affect beavers and bats. Beaverdams are helpful for natural preservation of wetlands and some wetland functions, but beavers are also a source of some forms of water pollution like all animals. Likewise, bats are helpful in ridding us of large numbers of mosquitoes and other insects each night, but bats are vulnerable to rabies. Conservation has to do with the where the decisions about the intermix of human and wild habitat fall. Having large numbers of people familiar with the issues in managing wildlife makes the conservation of the larger species in the Northeast Creek watershed that much more likely. So does have large remaining quantities of permanently undisturbed (even by wildlife lovers) open space.